I don’t have many She-Hulk images. “We’ve Got It Covered” is reporting that a She-Hulk series may be added to the Disney+ service. I’m waiting for confirmation (this could be a rumor) so if you’re seeing this then it’s been confirmed. Hopefully the Netflix heroes will get to move over there at some point, if only because not having an episode in which Jennifer Walters (who is also a lawyer as well as She-Hulk) is on opposite sides of a case with Matt “Daredevil” Murdock will be a disappointment. At least mention it in passing, but an episode leading to a She-Hulk/Dardevil team-up should really try to happen. I don’t even think the comics did this. Posted by ShadowWing Tronix on April 22, 2019 in Marvel Spotlight, Streaming Spotlight and tagged Disney, She-Hulk. She also went to an amusement park and got a lot of wrong ideas. Sorry this is late tonight and I didn’t have a Saturday Night Showcase. The short version is a new medication didn’t exactly help and I was sick all weekend. (Luckily it’s one I can do without.) I may still need a day or two in order to get back up to speed. I won’t have any comic reviews this week and it will be a few days before the next Chapter By Chapter review shows up. Sorry for the inconvenience. It’s been a crap weekend. Hopefully the rest of you had a better Easter. I’m also going to try to work on the video review if I can. I have to use my dad’s computer until I can convince my computer to run my video software, so I’m limited to when I have access and I didn’t have much this week. Hopefully I’ll get this done soon. Otherwise, it’s going to be a short week here at the Spotlight. Posted by ShadowWing Tronix on April 21, 2019 in Jake & Leon and tagged comic strip, Easter, Jake & Leon, web comic, webcomic. Again, I’m using the comiXology version so the other comics promoted in this special, Foster Broussard and Moon Girl, are not here. 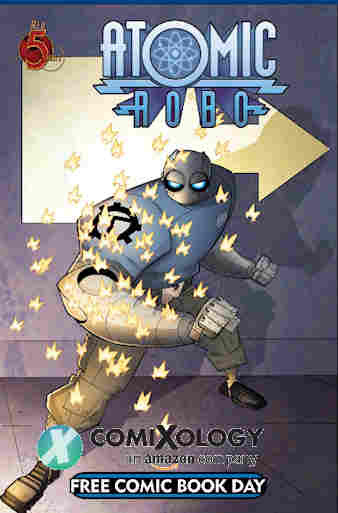 Given how hard it is to get an Atomic Robo Free Comic Book Day book when it comes out I don’t even know if I have it. So I’m only able to review Robo’s story. Posted by ShadowWing Tronix on April 20, 2019 in Yesterday's Comics and tagged Atomic Robo, Dr. Dinosaur, FCBD, Free Comic Book Day. I tried watching Dragon Ball Super once but for some reason I couldn’t get interested in it. I don’t know if it was just the wrong day of if something else was up, but it wasn’t clicking with me. And I enjoyed the other shows in the franchise. Even Dragon Ball GT produced some interesting concepts…just not enough of them and not always very well. I still enjoyed the idea that the Dragon Balls could be overused and the side effects that came with it. But why did they decide to make Goku a kid again? As this is a site about the art of storytelling, the below video from Masako X, who plays Goku in Team Four Star’s Dragon Ball Z Abridged, took a look at how some characters changed and whether or not it was for the better. Change can be good, if it’s a good change for the right reasons. Far too often I’ve seen characters change for no other reason than the author wanted that character to change even if fans loved him or her the way they were. The changes in the Dragon Ball franchise depends on the creator and writer, Akira Toriyama, his editors, and the people at Toei Animation who create the show (and to some extent Funimation’s dubs). Were they good changes or bad changes? Let’s ask “Goku”. Posted by ShadowWing Tronix on April 19, 2019 in Animation Spotlight, Comic Spotlight, Television Spotlight and tagged Chichi, Dragon Ball, Dragon Ball Super, Dragon Ball Z, Trunks, Videl. Even samurais are losing their jobs to robots. 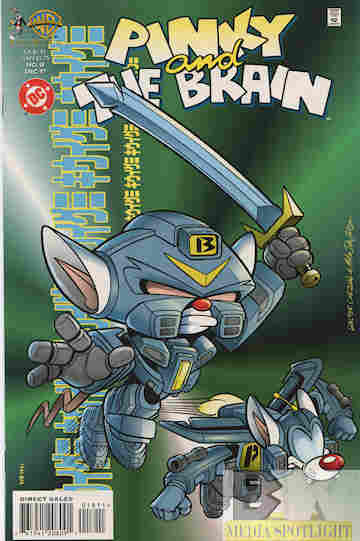 Posted by ShadowWing Tronix on April 19, 2019 in Animation Spotlight, Television Spotlight, Yesterday's Comics and tagged Pinky And The Brain. I’ve often talked about my favorite webcomic, Sean Wang’s sci-fi series Runners, about a group of smugglers who often get in over their heads. I first learned about it at ConnectiCon, and you can read both storylines over on his website. He just announced another way to read the comic, tthrough the digital service comiXology. (That link goes to the aforementioned website by the way.) You can read the comic on the app, although I don’t know if you can download the issues as only some comics can be downloaded for your personal archive. You can also order the hardcopy through his website and he just recently published the first volume, “Bad Goods”, in full color. (The version I have there is in black and white in single issues. He didn’t go color until volume 2.) However you read it I highly recommend this series. Posted by ShadowWing Tronix on April 19, 2019 in Comic Spotlight, webcomics and tagged ComiXology, Runners, Sean Wang. I still need to update this logo. Video games recently have tried to give a cinematic experience, to tell a story in which the player get to be the hero through a long adventure. Then again, that’s kind of what video games have done since the beginning, even if the story was just “aliens are coming, protect the Earth”. It is possible to have your story go so deep as to lose the fun of the game while some kind of narrative gives meaning to the actions you’re taking. Finding the balance is one of the missions of a game designer. Does your game need a strong narrative, something simple to give the player a goal, or is it just a puzzle or card game whose narrative comes from your victory, like playing Blackjack or Tripeaks? The team at Extra Credits examines when the narrative should be simple or advanced. Posted by ShadowWing Tronix on April 18, 2019 in Video Game Spotlight and tagged Computer and Video Games, Extra Credits, narrative, Video game, video games.